When a tablet or laptop goes walkabout, how do you know which is which? There are two issues relating to tablets and laptops in schools at the moment. One is that the rate of growth in the number of tablets and laptops in schools is actually increasing. I can’t say the increase is exponential – but it is certainly growing fast. The other is that the number of tablets and laptops that are being temporarily “lost” is growing too, and that is worrying. This is not to say that the “lost” machines are removed with criminal intent. In fact, it is only a tiny minority of machines that are actually stolen. What happens is that a person in the school legitimately takes a tablet or laptop to use, but then subsequently this specific tablet/laptop is hard to locate. To help with this most schools mark all their portable IT equipment. There is a problem though. Tablets and laptops are invariably made of either aluminium or hard plastic with a cured paint to make it hard and scratchproof. 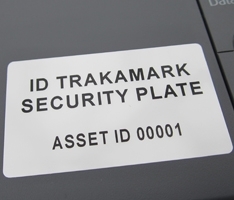 This makes putting identification marks on the equipment difficult, because you simply can’t 'etch' anything into aluminium or hard plastics as they do not have a porous surface. One way out of this dilemma is to use aluminium trakaplates which, because of the thickness and strong adhesive that they use, are near impossible to remove. In fact, the only way you could get such an identification label off a machine would be to lever it off with a screwdriver – which is extremely hard to do. 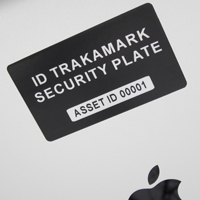 An alternative approach is ID Silver Mark labels. These labels are precision cut stencils which can include your school name. The labels are then painted with UV ink to show up should the label be removed. 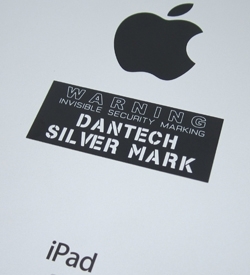 If you have tablets or similar objects of value in the school and you would like a way to identify them as school property and are looking for expert unbiased advice then contact Dantech on 01354 688 488 or complete our contact form .